Weigela floribunda.Gary P. Fleming.Atlas of the Virginia Flora.www.vaplantatlas.org.2014. Virginia Botanical Associates, Blacksburg. (Accessed 6/2014). 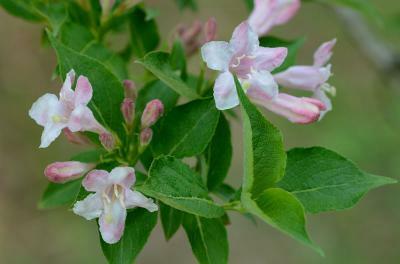 Weigela floribunda is a shrub to 3 m tall, branches stout, twigs finely hairy. Leaves opposite, stalk very short, to 0.5 cm; blade more-or-less elliptic, 7-10 cm long, tip long pointed, base wedge-shaped, hairy below, margin finely toothed. Flowers pink and white, to dark red, funnel-shaped, tubular, 3 cm long, finely hairy outside, petal lobes much shorter than tube, style to 1 cm longer than petal lobes. Fruit a dry capsule, finely hairy. Habitat: Escaped from cultivation (Stalter and Lamont 2002) or an overgrown specimen.